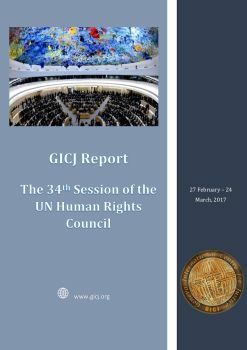 The 34th regular session of the Human Rights Council was held in Geneva from 27 February - 24 March 2017. The Council adopted 41 resolutions on a variety of issues, as well as the Council’s report for the session, and the outcome of the Universal Periodic Review of 11 countries. Moreover, 3 Special Procedures mandate holders were appointed. GICJ participated in the 34th session of the Human Rights Council by delivering 14 joint oral statements and submitting 11 joint written statements. GICJ further co-organised two side events on different topics, one covering the human rights situation in Palestine, and the other on human rights education and the obligation of governments to prevent incitement to racial hatred and hate speech. The official copies of the written reports submitted to the Human Rights Council will be available to download at the bottom of the page, along with the summaries and videos of the side events.